The Barn was in use on Saturday night. For the first time in 3 weeks in fact, as the Stallions hosted the nearby rival Muskoka Anglers. 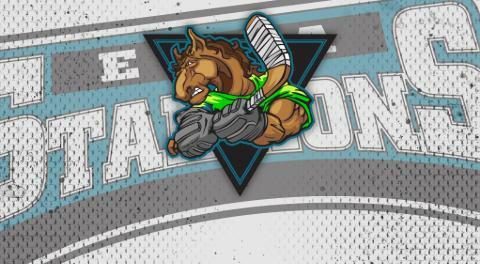 Despite the long layoff, and getting rid of the hockey rust, the Stallions prevailed in a 3-2 victory! After a scoreless first period, which saw the Stallions outshot Muskoka 15-10, The Anglers popped one past Stallions goaltender Matthew Server, to take a 1-0 lead early in the 2nd. The Stallions would respond a little over 12 minutes later, with a quick wrist shot from Daniel Spannar to tie it up 1-1. Shots were 17-8 in favor of your Essa Stallions in the 2nd period. 3rd period would see a tightly played game by both teams, but the Stallions were able to track down a loose puck in the crease, as Parker Stewart would tuck it home to give Essa a 2-1 advantage almost half way through the 3rd. 5 min later, a blue line blast from Adam Leavoy would make it 3-1 Herd! Leavoy's goal, would prove to be the winner, as Muskoka would add one late to make the final score 3-2! The Stallions outshot the Anglers 48-31, which saw Matthew Server get the win for Essa, his 6th of the season! "I thought we were rusty tonight. We've been off for a few weeks and it showed. We dug deep and did enough to get the two points, and really at the end of the day that's all that matters" said Head Coach Sylvain Cloutier. "Sometimes the long breaks teams get can be a good or bad thing. Unfortunately for us it came at a time where we were really hitting our stride. We have some hard work to do to get back to where we want to be." Cloutier added. Stallions will have a good week of practice, and hit the road for a game on Friday night as they travel to Seaforth to battle the Generals. Saturday night will see the Herd host the visiting Maniwaki Mustangs for 7:30 pm puck drop at The Barn!